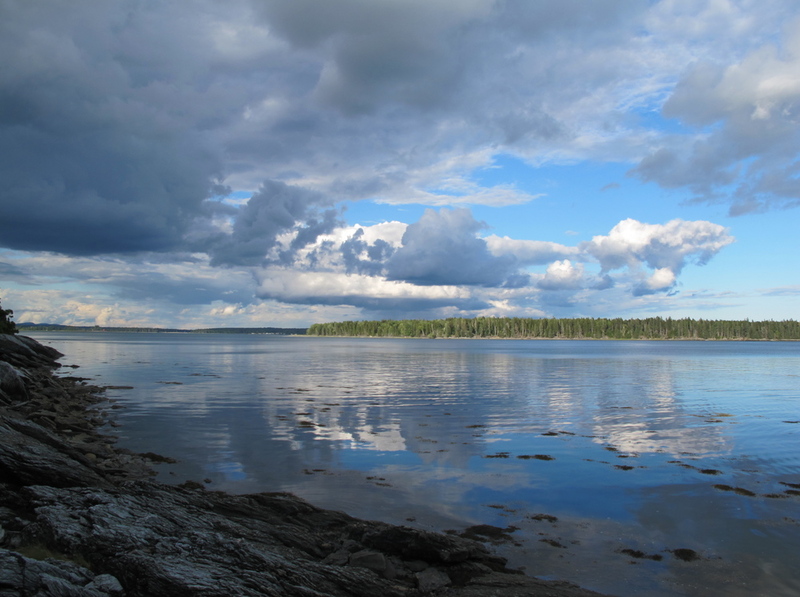 A taste of the Maine coast, in case you aren't lucky enough to be up here right now. 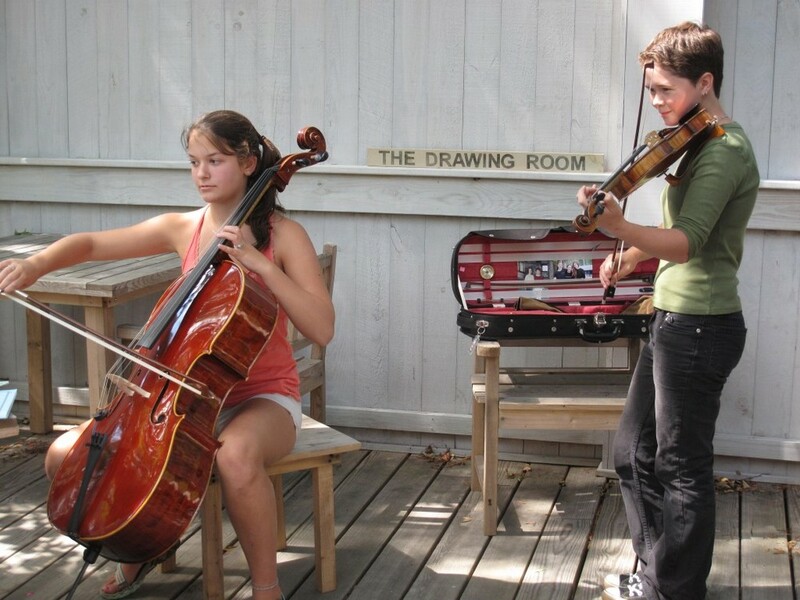 Teen phenoms: Violinist/fiddler Emma Walsh and cellist Melanie Ambler performed on the deck at The Naturalist's Notebook on Thursday. One of the nature collages from Kathy Coe's Tuesday kids' art workshop at the Notebook. A 10-year-old boy saw a crowd of grown-ups gathered outside the Notebook trying in vain to identify this large flyer attached to an upstairs window screen. He declared, "That's a polyphemus moth!" He was right, of course, as 10-year-olds so often are. I love moments like that at the Notebook. Our Wednesday-morning Earth News kid-reporter program has begun. Last week we went to the green in Seal Harbor to shoot video segments on bees, bugs, and each other. One of the many titles Regina Ryan has published as either an editor, a book packager or a literary agent. Pamelia and I met Regina Ryan in 1995, when we bought a tiny 1780 farmhouse set on a beaver pond in Sherman, Conn. Regina and her husband, Paul Deutschman, the former Life magazine writer and author, owned the only other house on our little dirt road. Regina had been the editor-in-chief of Macmillan Adult Books (the first woman to hold so high a position at any major hardcover publishing house) and also had been an editor at Alfred A. Knopf. She had launched her own literary agency, Regina Ryan Books, based in New York. When we heard that Regina was taking a trip north to Nova Scotia this summer, we asked if she would stop in to visit us and give a talk. We love to promote creativity and writing, and we sell several of Regina's many titles, including The Garden Primer, by Barbara Damrosch (who lives in Maine), the Acadia National Park Pocket Guide, and America's Medicis, by Suzanne Loebl (who summers up here, along with the famous family she writes about in the book). Regina will give a talk at the Notebook, called "So You Want to Write a Book," on Monday, Aug. 1, from 5 to 6 p.m. She'll tell stories about how some of her books came together and offer tips to would-be authors. Please stop in for a fun and enlightening hour. It all began when I was dive-bombed by a hummingbird. I had just moved to a lovely little farmhouse in the woods in Sherman, Conn., and was working in the garden. I was astonished by the bird – I somehow thought they were tropical birds. That led me to come up with the idea for the book Theme Gardens, which included a hummingbird garden, a colonial garden, a moonlight garden and many others. At this time I was working as a book packager or developer, and so had to put the book’s team together. I approached Barbara Damrosch, a young woman who was the editor of the tiny local paper, to write it. I had read her funny essays in the paper, and I knew she worked designing gardens for folks. I then sold the book to Workman and it was published. What struck me most about Barbara was her ability to write about gardening so clearly that anybody could understand it. So I thought a beginner’s guide to gardening would be perfect. We proposed a couple of ideas to Workman for our next project, including the beginner’s guide. Peter Workman jumped at the idea of the primer and the rest is history. Barbara and I began work in l986 – with her writing and me editing. The first edition came out in 1988; it was completely revised in 2008. It has sold just under 400,000 copies. Theme Gardens is still in print as well. I was at a professional writers’ conference in New York, doing what we call “speed dating” – where an author has ten minutes to pitch ideas to an agent. Suzanne Loebl, whom I knew, appeared at my table. She quickly ran through a few ideas that were nice but not very exciting. Then, towards the end of our allotted time, she told me a story that hooked me immediately. She said that in the course of traveling around the country to write her previous book on America’s art museums she had been startled to realize how many museums and collections in America had been funded by the Rockefellers. Yet no one had brought it all together. Did I think it was a book? Absolutely, yes. Here was an important family, making a great contribution to our country, that was little acknowledged and hardly known. It was a wonderful subject, and clearly she was the right author to do it. That was in 2005. The book was published just this past year – in 2010. Happily, it is getting an amazing amount of attention and is selling well. The first I saw of this book was when two large black portfolios of photographs landed on my desk unannounced, with a text to go with it. I thought the photos were spectacular, but the text was lame. I told the author the problems I had with the text, and sent the portfolios back, thinking that was the last of that. A year later, the portfolios arrived again – unannounced -- on my desk.. This time, the text was excellent. Ed Stump had, amazingly enough, taken my advice and spent a year reworking the manuscript. However, now there was another obstacle in its way. I had decided not long before that I would no longer represent heavily illustrated books because they just weren’t selling. But looking at the incredible beauty of the photos of places that almost no humans had ever seen, at the astonishing views taken from the tops of mountains that the author had climbed, at the maps with overlays showing the routes of Amundson and Scott and Shackleton – and then seeing photos of the unchanging landscape that was still the same as what they saw – convinced me that this was such an important and original and wonderful book that it just had to be published. Ed Stump and I agreed to work together in 2007 and spent a lot of time perfecting the text and the proposal (an art form in itself). It then it took me a number of years to find a publisher. The book will finally be published by Yale University Press in January 2012. The advance quotes are terrific. I am extremely proud of this book, and of my friend and author, Ed Stump. Fact of the Day: June was the 316th consecutive month with a global temperature above the 20th-century average. July, it's safe to say, will extend that streak to 317. The last month with a below-average world temperature was February 1985. Lizards are not amphibians, invertebrates or mammals. They are reptiles. True or false: One way to tell moths from butterflies is that butterflies have thin antennae that are club-shaped at the end while moths tend to have feathery or comb-like antennae.